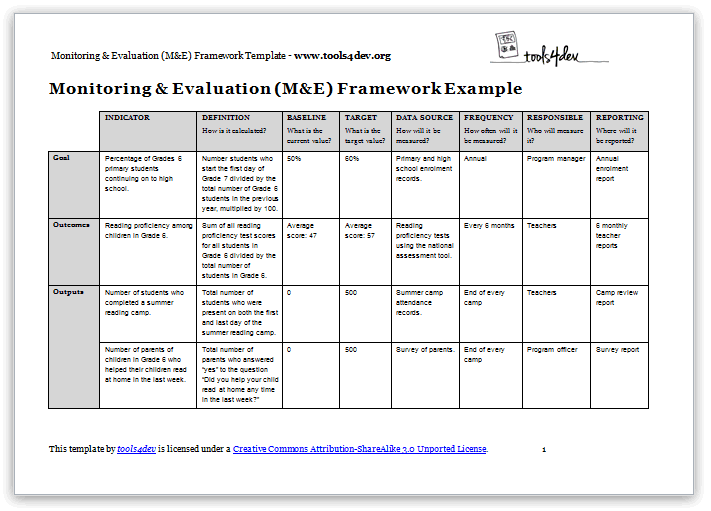 Note: An M&E framework can also be called an evaluation matrix. As with most things in international development, there is no standard definition of a Monitoring and Evaluation (M&E) framework, or how it differs from an M&E plan. For many organisations, an M&E framework is a table that describes the indicators that are used to measure whether the program is a success. The M&E framework then becomes one part of the M&E plan, which describes how the whole M&E system for the program works, including things like who is responsible for it, what forms and tools will be used, how the data will flow through the organisation, and who will make decisions using the data. In other organisations the whole M&E plan is called an M&E framework (as if things weren’t confusing enough!). This template and example are based on the most common definition of an M&E framework. That is, a table that lists all the indicators for your program, including the data source, baseline, target, how often it will be measured, and who is responsible for measuring it. For detailed instructions on how to use the template see the how-to guide. You need to describe the indicators that will be used to measure the success of a small to medium size project. The donor has not provided a template for you to use. You need to describe the indicators that will be used to measure the success of a very large or complex project (in this case you may need a more detailed template to describe it). The donor has provided a template for you to use (in which case use their template). Don’t like this M&E framework template? Try this other template from Charities Evaluation Services. The M&E framework template by tools4dev is licensed under a Creative Commons Attribution-ShareAlike 3.0 Unported License. All other content is © tools4dev.